Siemens’ extensive portfolio of low voltage drive systems is the most complete and thoroughly integrated family of drives in the world. With a high level of flexibility, functionality and engineering comfort, our systems cover all performance levels — from simple frequency converter tasks and coordinated drives through to motion control tasks. 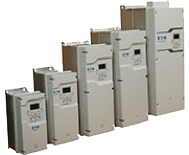 High-performance drive inverter for dynamic drives in power range 0.55 to 160 kW (0.75 to 215 hp). Great diversity of applications due to extensive expansion options with technology and communication options. 3-phase mains connection for AC 230 V and 460 V.